Ruchie Freier has made a name for herself as someone who advocates for children at risk, who created the all-female ambulance corps Ezras Nashim, and as the first chassidic woman to become a NYC judge. A deeply intelligent woman who commits heart and soul to her causes, Freier is a force to be reckoned with. Yet as she judges cases at night court, helps deliver a baby, or advises a misguided youth, her compassion and kindness shine through. The creation of Ezras Nashim has been committed to film in the documentary 93 Queen. Ezras Nashim was recently awarded NYS and NYC 2017 EMS Agency of the Year. The code 93Queen was assigned as the radio code by the NYC Fire Department once recognized as an agency. I had the honor of speaking with Judge Freier and gaining more insight into her dynamic personality. Q. Are you glad that 93Queen, the documentary about Ezras Nashim, is bringing more awareness to all-female ambulance corps or concerned it will attract more trouble? A. Before I tackle any project, I speak to my rav. I think long and hard about what I do. There are always consequences. When you do something that’s right, it’s always going to be hard. My rav gave me chizuk and said, “When Hashem gave a berachah to Avraham, He said, ‘Mevarechechah Avareich.’ Is that the best that Hashem could do? Why wouldn’t everyone bless Avraham? Because anyone in the public eye will have opposition. In Megillas Esther, it says that Mordechai was accepted by most of the Jews. Not by everyone. I won’t let that stop me from doing what’s right. It’s an opportunity for a kiddush Hashem. Q. The movie was really well-done. It looks like a movie with ten times the budget and crew. How did Director Paula Eiselt manage to get you all to be so honest? A. I call her Penina because we fully included her in the Boro Park community. I was really impressed by her sincerity. I wanted it to be successful. If I’m going to agree to do it, it should be a success. It was really hard. There were a lot of tough decisions to make. I believe in her mission. When she told me her role is to create a kiddush Hashem and show the world who we are as religious women, it was important enough for me to go out of my comfort zone and make it. Q. At one point in the film, you confess it would have been easier if Hashem made you a man but in another interview you say you are comfortable and happy in your role as a woman. Does this feeling change each day or has it developed more over the years? How do you feel now? A. It is not a contradiction. I love the role Hashem gave me. I couldn’t help but think that while Hashem could easily have made me a man, He knows better than I the reason I am a woman. I contemplate and thank Hashem for creating me as He saw fit, she’asani kirtzono, and He gives me this opportunity. Q. I must admit I didn’t think you were human until you burned the gefilte fish. That was the moment I thought, “I can relate to her. We all share these problems.” How often does life get stressful and overwhelming for you? What do you do about it? Do you ever take a vacation? A. I’m like any other frum woman. Raising kids. Taking care of the house. I have life challenges like everybody else. I want it to be that way. I wait in line at the grocery store as everyone else. Sometimes we burn the fish. We burn the eggs. We put the chicken in the oven and forget to turn it on. Gam zu l’tovah. Q. Your husband seems like an amazing man, a true ezer kenegdo (even though that term is usually used for women). What does he do? Did he ever question this path? A. My husband, Dovid, is a true trailblazer. He learns Torah for more hours than many people in kollel. He authors sefarim. As it says, “Tzu Gutt un tzu latt” — he is pleasing to G-d and pleasing to man. He is devoutly religious. A true chassid. He is so knowledgeable about the world and is one of my strongest supporters. When we first got married, he was in kollel. When we had our third child, he decided to go to college to help carry the financial burden. He majored in accounting and finance. Now he’s a commercial mortgage broker. Then it was my turn to go to college and he was extremely supportive. He really is a true trailblazer. 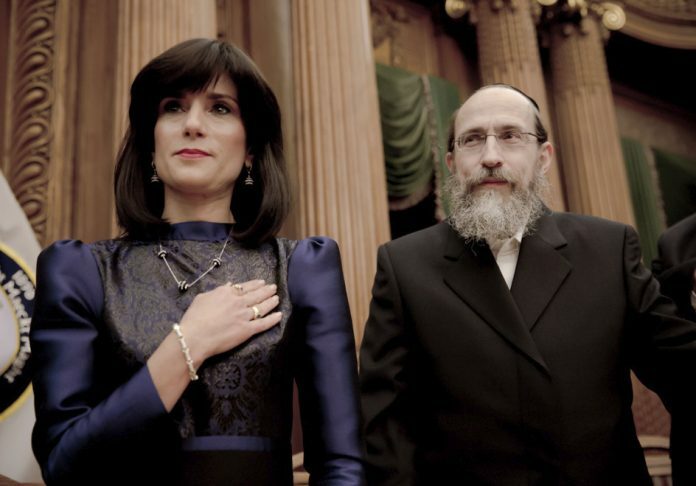 The first chassid to support his wife to run for public office and finance her campaign. Without his support, it couldn’t have happened. 93Queen shows a key moment when the women decide not to allow never-married women for serve as first-responders. A ba’alas teshuvah named Yocheved, who as an EMT helped Ezras Nashim with professional guidance, disagrees with this decision and leaves the organization. Q. What happened with Yocheved? It’s a shame she didn’t feel she had a place in Ezras Nashim’s future. Have you tried to reach out to her and welcome her back in? A. It was her decision. Anyone who runs an organization understands. These things are difficult. The goal is to help people. When we realized we couldn’t be in Hatzalah and had to do it on our own, it was a tremendous decision with tremendous risk and sacrifice. I had so much responsibility to undertake. I had to work with rabbanim and the law. Other people couldn’t understand what I was taking upon myself. I had to make tough decisions, not because I was trying to control everyone. These decisions had to be made for the organization to exist. I never shut the door on anyone. Q. How do you feel when your daughters say on screen that they want to be doctors and lawyers? On the one hand, we want the path to be open to everyone, on the other, we know the sacrifices. A. The opportunity should be there and everyone has to make their own choice. In any job, for example, a store owner or a sheitel macher or a doctor, you can be there for your kids or you can be traveling and away much of the time. It’s in how you do it. Kids today are lucky they have opportunities. Q. I cringed when you mentioned in your weekly report that you responded to a domestic-violence case. How much of this has Ezras Nashim seen? Do you think more openness about domestic violence is another advantage to having women EMTs? A. We don’t see a lot of these cases. Yes, we know it exists. For sure, women are more likely to open up to us. Q. Do you think the Ezras Nashim concept will spread? Have your numbers grown? A. Since the film came out, I’m getting emails from other communities to begin Ezras Nashim there. For example, in Toronto. In time, I would love for it to spread. Each community needs to ask a rav their she’eilos. Don’t miss this glimpse into the creation of Ezras Nashim with all of the conflicts and challenges involved. The film is being screened July 25–31 at the IFC Center before moving on to the West Coast.